Whatever be the occasion, Olesia has the best collection of stylish clothes for your baby girl. With us you need not look any further for knee length dresses. You get all styles under one roof with us. Our collection of short dresses will make your girl look pretty and trendy at every event. 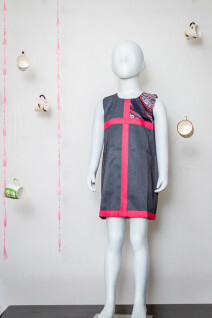 Check out the trendiest kids’ sleeveless dresses from our collection of Shift Dresses today! Knee length dresses are the most popular among kids because of the comfort and trendy feel of the attire. The collection is huge and ranges from various designs, colours, and prints. All three are chosen as per the age in order make little girls look like a fashion icon at the party. 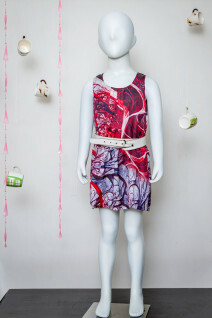 The lovely colours and trendy prints make the short dresses look very beautiful. Olesia also has a collection of long sleeve dresses, dolman sleeve dresses, spaghetti dresses, halter neck dresses, among others. Little girls can choose from the wide range of dresses as per the occasion and your liking. At Olesia,we never compromise on the quality of fabrics used to make the gorgeous knee-length dresses for kids. We understand that the delicate skin of kids requires a lot of care and affection in the early stages of development. Therefore, we use high-quality viscose and cotton fabrics to make the most comfortable outfits for kids. Our knee length dresses for kids are breezy and loose to accommodate the free movements of active children. You will have unending choices with Olesia when it comes to dresses. At every occasion and in every season, short dress is the winner. It’s an attire that can be pulled off equally well in every event, no matter the setting. You can wear it for a casual outing, an evening party, a lunch event, or a regular day out. It always makes one feel comfortable and easy to carry. You can choose from various styles that you prefer as per the age and liking of your little girl. 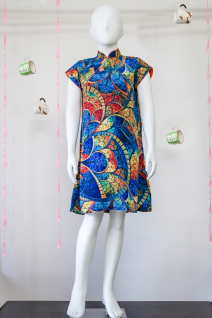 Check out the printed dresses with bright and colourful options, trendy sleeves and great material. If you like your little girl to be in trend with the latest fashion, this is your go to collection for dresses. We use high-tech digital printing machines to print trendiest design schemes on the kids’ sleeveless dresses. During the summers, you can go for a short sleeveless dress or a spaghetti dress for your little girl. It will make her feel breezy and keep her comfortable wherever she is. While adding ease to her movements, they will also make her look pretty and stand out in the crowd for wearing cool dresses. These sleeveless dresses are ideal for tropical weather conditions. The beautiful sleeveless sundresses for kids are perfect for a poolside or beachside party. Summer times can be tricky in terms of choosing clothes. You want your baby girl to look trendy as well want her to feel comfortable. This problem ends with us. 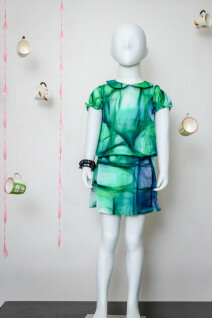 You can now choose clothes that are made of the highest quality fabric that make your little girl feel breezy and cool. When winters come, you can choose to go with long sleeve dresses. These can keep her warm while keeping her in line with the latest fashion. In winters you can also go with darker colours as opposed to summers, where you can choose bright and fresh colours. We have dresses for every occasion because we know that a girl needs to be dressed uniquely for every occasion and season. Shop Online for dresses with Olesia.